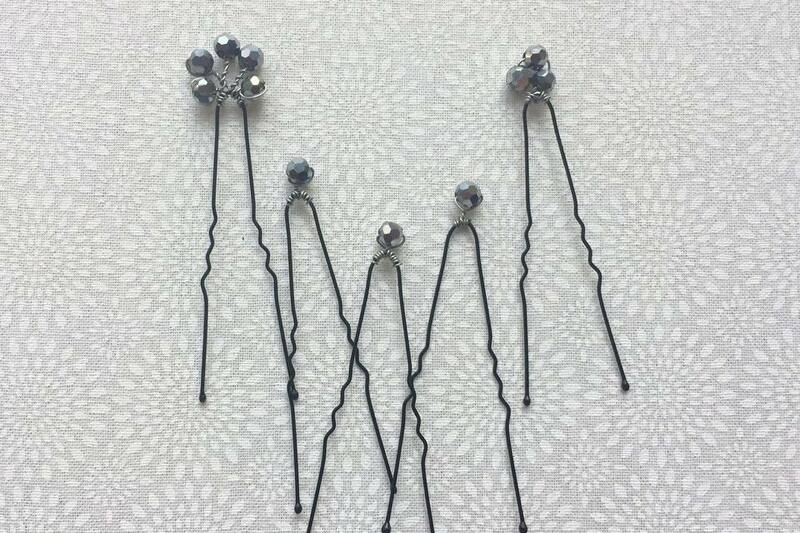 Hairpins and bobby pins are a must to dress up your hair for formal events like weddings and proms. They can transform a simple updo or braid into an eye catching coiffe (also known as a fancy hairdo!). But, there's no need to limit your use of beaded hairpins to special occasions and holidays. Use them anytime. And another great reason to make your own is that you'll have exactly the colors and styles you need to go with your outfit. There is nothing more frustrating at prom time than scouring multiple stores to find the right hairpins and coming up empty. You can avoid the disappointment with just a little planning, plain hairpins or bobby pins, some beads and wire. If you are not familiar with them both, hairpins are slightly different than bobby pins. Most people are familiar with bobby pins, which are open ended clips perfect to hold your growing-out bangs to one side or fix those pesky short pieces back for a smooth ponytail. One thing about them that we bet you didn't know is that you are probably putting bobby pins in your hair the wrong way. Most people put the wavy side facing up, but that side is intended to be against your head, helping to provide resistance against your other hair and scalp from slipping out. The flat side of the pin is intended to face up. Trust us–once you start using them the correct way, you will never go back. And another benefit is that it makes them much easier to add beads to when you put the curvy side facing down. Just like a hairpin turn, hairpins are u-shaped and not fully closed. You may think of them as something your grandmother used, but if you have longer hair, you should definitely give them a try. They can help keep your buns in place, smooth stray pieces of hair and add sparkle while providing hold. While we worked with both bobby pins and hairpins, this tutorial can easily be applied to all different types of hair clips, so check out this guide to hair accessories to help you find the right type. There are only a few tools and materials needed for this DIY. Obviously, the first think you'll need is a hairpin or bobby pin. There are so many sizes, styles and colors to choose from, be sure to be selective and consider the hairstyle you plan to use them for. 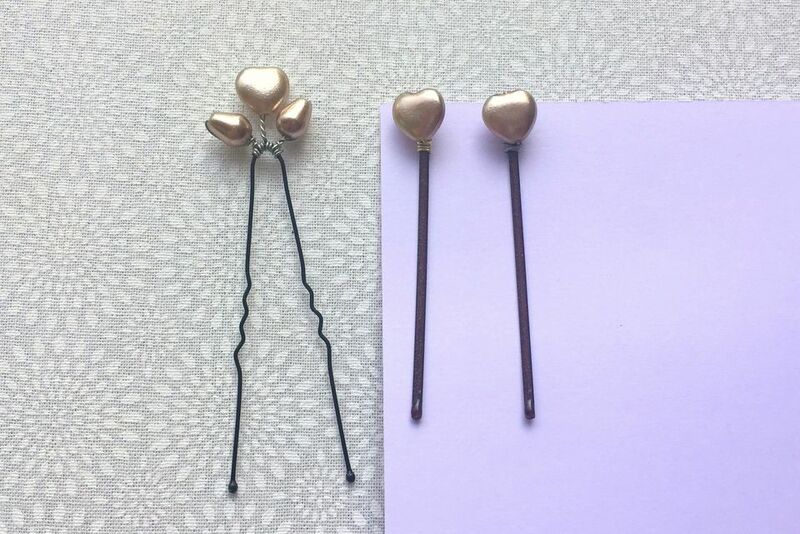 Most beads will work for decorating hairpins, but the hole must be large enough for the wire and ideally they should be able to withstand hairspray (which typically contains alcohol). Find a thin flexible wire to attach the beads–26 gauge craft wire worked perfectly for this example; 24 gauge was too thick and was hard to wrap tightly around the hairpin or bobby pin. An even thinner wire, such as 28 or 30 gauge may also work, as long as you don't overwork it and bend it too much, which could cause it to break. You will also need wire cutters and pointy nose pliers. I have a pair of bent nose pointy end pliers from Xuron that I highly recommend for these types of tasks. Cut a piece of wire. If you are attaching a single bead, it should be about 4 inches long. For three beads, you will need at least 6 inches of wire. There will be plenty of extra wire with these measurements, but it is easier to wrap and hold tight when you have a little extra. Add the bead and slide it to the center of the wire. Fold the wire around the back of the bead and twist the wire beneath the bead to keep it in place. Wrap the wire ends around the hairpin, one to each side of the center bead. If desired, use the wire ends to add more beads to the hairpin. Slide the bead on, leave some space for twisting or wrapping the wire and bend the wire back around the bead like you did for the first bead. It can be difficult to twist the wire around the stem to hold the bead in place. You can twist the bead, which will twist the wire, but be sure not to overdo it or the wire can snap. Wrap the wire two or three times to secure them and press the ends in place. If possible, use the pointy plier tips to squeeze the wire coils close together. The technique is similar for making a bobby pin, except instead of perching the beads on the end of the pin, you want them to lay flat across the smooth flat side of the bobby pin. You need to wrap smoothly and work in a tight space, which is why it is easier to start with making hairpins. Once you've got the hang of it, you can make sets of hairpins or bobby pins for special occasions or gifts.